The ACCP Research Institute, the charitable arm of the College, has been transformed into the ACCP Foundation. This transformation signals the organization’s expanded mission to more broadly support ACCP member interests. The Foundation will maintain the organization’s primary commitment to research, including investigator development programs, grant funding, research/scholarship workshops, and educational programming at ACCP meetings. In addition, the Foundation will broaden its portfolio to include support of advanced practice and a wider range of scholarly opportunities. 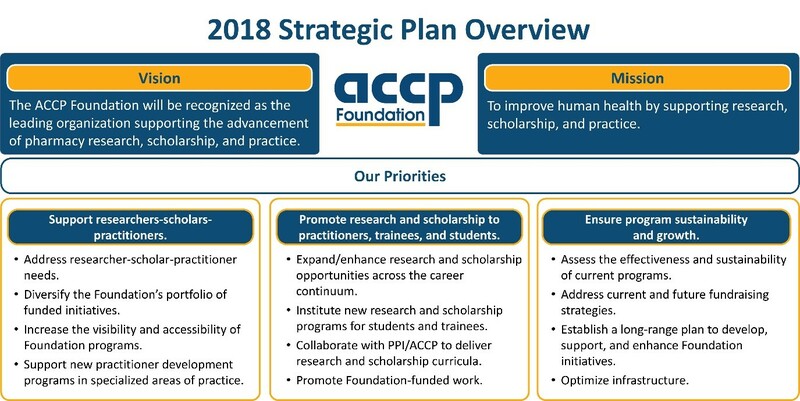 The Foundation’s new strategic plan outlines the initial steps in this transformation, which include implementing new funded initiatives that meet current member needs, collaborating with ACCP to support clinical traineeships/mini-sabbaticals in specialized areas of practice, creating an ongoing curricular plan for PPI/Foundation-codeveloped educational programs, and establishing funded research internships for Pharm.D. students. The Foundation’s vision, mission, and priorities are summarized in the figure below.